A federal bankruptcy judge Monday awarded the rights of O.J. Simpson's canceled "If I Did It" book to the family of the late Ronald Goldman to satisfy a $38 million wrongful death judgment against the former football star. U.S. Bankruptcy Judge A. Jay Cristol's decision pushed aside complaints from the family of Simpson's ex-wife, Nicole Brown Simpson, who was slain along with her friend Goldman in a 1994 knife attack. Lawyers for the Brown family had sought a greater share of possible profits from the book. 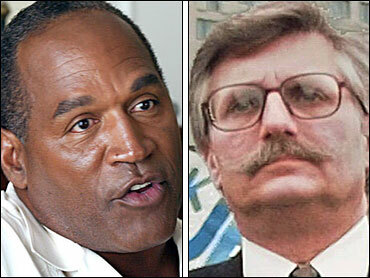 Simpson, who now lives near Miami, was acquitted of murder in 1995 but lost lawsuits to both families. Fred Goldman, Ronald Goldman's father, choked back tears outside the courtroom and said he intends to release the book as a measure of justice to portray Simpson as "a wife-beater, as a murderer, written in his own words." "After 13 years of trying to get some justice, today is probably the first time we had any sense of seeing light at the end of the tunnel," said Goldman, who attended the hearing with his daughter, Kim. "It's gratifying to see." Lawyers for Brown's father, Louis Brown, objected to a settlement awarding the rights to Goldman. The Browns wanted Cristol to give equal rights to all the creditors, rather than allowing the Goldmans to collect the lion's share of any profits from the book. "It allows the Goldmans to recover at the expense of the Browns," Brown attorney Stephen Rakusin said. Simpson has maintained his innocence and insisted that most of the "If I Did It" manuscript was penned by a ghostwriter without his involvement. He was paid about $630,000 even though the book was canceled last year amid public outcry. The book wound up in a Miami court after a corporation headed by Simpson's eldest daughter, Arnelle, filed for bankruptcy shortly after a judge in California ordered the rights sold to benefit the Goldmans. The corporation — Lorraine Brooke Associates — had negotiated the book deal with Harper Collins, with the Simpson children as its main shareholders. Cristol found that the corporation was essentially a fraud to hide the involvement of Simpson himself, making the Goldmans the chief creditor on the book rights. The Browns, who won a $24 million wrongful death case against Simpson, got involved in the bankruptcy case in the 11th hour. Under the settlement, they will get a chunk of the first 10 percent of gross proceeds from the book, with the Goldmans getting the rest. But the Goldmans also will have to bear such costs as finding a publisher and marketing the book. Cristol said he regretted that the case had produced such animosity between the families. "They're both the victims of a horrible tragedy. It's sad they would be reduced to quibbling with each other instead of working together," the judge said. Goldman said he has no plans to alter any of the Simpson manuscript, which describes how the slayings might have been committed and discusses at length Simpson's relationship with his ex-wife. But Goldman said the family may add a prologue or other "enhancements" to what was already written. It remains uncertain exactly how profitable such a venture might be. Goldman attorney David Cook said that discussions continued with literary agents, publishing houses and movie studios, but that none of the Goldman lawyers would provide details. "We're very confident," Cook said of the book's prospects. "We will do our level best. Only time will tell."